Who will share your life this year? Research has shown that how you answer that question will impact your well-being more than any other factor–even income, where you live, or your life circumstances. So choose wisely when it comes to the people you surround yourself with in 2014.And there’s a certain kind of relationship you can be looking for more than any other. I’ve nicknamed them “O.A.R.s” and that stands for One Another Relationships. Picture someone sitting in a boat with an oar in each hand. In order for the boat to move forward, those oars need to be in sync and pulling in the same direction. 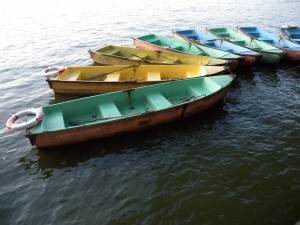 Each person in a relationship is like one of those oars and God is in the middle–the center of the connection. p.s. Life coaching is also an O.A.R. relationship and I’ve got limited spots open for 2014. I love “one another relationships.” The words one another hold great significance throughout the Bible. Be kind to one another, love one another, and too many more to list in this comment space. You have painted a beautiful picture with OARS. Love it! Have a great weekend, friend! I can’t help but think of the ladies in my Bible study group, I have seen all of us be there for each other for so many different aspects of our lives. Yes, connecting with a group of women is one of the most wonderful ways to find OARs. So grateful for the groups in my life too–in person and online! Oh this is beautiful. God has surrounded me with such a beautiful group in IRL women. And in blogging I want to be even more intentional at pursuing those relationships. Love this, Holley. I couldn’t agree with you more. Thanks for sharing this! Lisa and Heather, I love to hear how God answers when we ask! Thanks so much for sharing His personal response to you. God is so very good. Joining you in asking God to surround you with people who encourage instead of discourage, Lisa! Good words Holley! Love the idea of MOVE – and the boat…, perfect illustration! In the past I’ve been intentional to not allow too many negative people close to me, but I’ve never thought of people propelling me!! Girl, you are a beautiful OAR in the lives of many. So glad God connected us! Holley, thank you! A few hours before I read this, I was just feeling the Lord encouraging me to ask Him (again!) to show me who was going to help me move forward. Almost the same words you’ve used here were coming to my mind…wow! Thank you. I love it when God speaks similar messages to our hearts through His Holy Spirit. Praying He gives you just the people you need to move forward into more of what He has for you in 2014, Heather! Amazing! Awesome! Astonishingly good! I like that O. A. R.s, One Another Relationships. Happy New Year, Holley! Loving marriages are one of the very best OARs in life. I’ve got a hubby that sounds a lot like yours. So grateful for the men who encourage us! So true Holley! I love this I really see that when we let go of negative relationships it makes room for the positive & growth that Christ wants to bring into our lives. Once again, right on target!! I love how you said that: “it makes room for the positive and growth.” I sometimes forget that and this encourages me to remember! Thanks for sharing, Linda! As I read your post, one of my coworkers came to my mind right away. She is definitely one of those OAR people in my life. I am so grateful to have her in my life. Blessings! You are definitely an OAR. I always look forward to reading what you have to say. You give me daily encouragement. Thank you for telling me I’m an OAR, Lisa, your words mean a lot to me! I look forward to reading your emails every day and to know that they are bringing me encouragement and they up lift me with my daily life. I’m so grateful that you’re reading and being encouraged, Margaret! Thank you for being here! An OAR for over ten years…how fun and such a blessing. Love hearing how God has joined your hearts! Praying this year brings even more joy in your friendship with Linda! I wouldn’t be exaggerating Holly, if I said that this is the most enlightening post I’ve read in quite a long time. I’ve been so much busy in other areas of my life that the relationship part remained almost neglected. However, now things will change. Thanks a lot. Although I have a group of lovely OARS in my life, this post has opened my eyes to the possibilities of 2014, to open my heart and mind and allow myself to engage in new relationships if it’s in God’s plan. I shared this post with my daughter and she feels the same way. Although we’ve all been disappointed at times, we should stay open to welcoming new people into our lives, knowing things won’t always be perfect….nothing is!! OAR is what this world needs. according to Tiffani Thiessen. He was known for making beverly hills 6750 prices one-of-a-kind jewellery and often donated profits from her business to charity. however, to attribute too much credibility to either. 6750 prices atrocious and God said, it happened organically.